Is it not the very height or epitome of hypocrisy for one to brag that he has crucified his flesh, and at the same time teach that God is solely responsible for all that occurs in his Spiritual decisions. Are we not called to follow Christ in His offer of the gift of salvation and thus to trust Him for the bringing about of His righteousness in us, and for the sanctification of our lives in Him. In this post I’m sharing, the very man who could not do so much as to bring himself to believe God when presented with the good news of the Messiah, appears to be taking it upon himself to crucify his own flesh in order to be “the true follower” of Christ Jesus. He is one of only a very few to whom salvation is intended. He criticizes the man who claims his obedience to Christ but who has not been successful in crucifying his flesh, while still claiming that only God can do this for him. Yet he is the one to whom God has allowed to crucify his own flesh by “in his religious jargon” ceasing to sin and ceasing to satisfy the flesh. To him it is fact that God has granted to him and only a precious few like him this ability to put to death his flesh. So is it no longer his responsibility to walk in faith knowing God will one day do this work? He has apparently already done this work that separated him from the rest of us sinners who must cling to that future blessed hope of a new body. And then of course there is no longer the need for repentance for sin and I guess no longer a need to pray and trust God for strength to resist temptation. For this one is already dead. He must have already arrived as a son of God. Creation is no longer awaiting his revealing as a son of God. Sorry but I cannot embrace that my future new man, one without sin, is no longer seen as my blessed hope. This to come about when Jesus returns to give me this new glorified sinless body. Apparently, if I only believe as he does then God will elevate me to actually being dead in the flesh. I no longer need to walk in the Spirit that God may by His own grace give me power to resist temptation, but I am now fully able to put to death sin in my own members. I can control what God does for me in my life, just as He can if I just believe his way. Again I ask is it not hypocritical to believe that I have no part to play in responding to the gospel of God’s grace and yet it is up to me to believe properly and thus to be one of the few who is able to crucify my own flesh and thus cease my total dependence on Him to one day deliver me from this body of sin? I hope that I have not misrepresented what is being emphasized here. But the conflict and confusion presented on this sight seems to be more than a battle between the Spirit and the flesh, it is more a battle of the mind over words and their meaning. The very next verse in Galatians 5:26 states that we are not to be boastful. In fact let’s look at some additional verses in Galatians. It was for freedom that Christ set us free; therefore keep standing firm and do not be subject again to a yoke of slavery. You have been severed from Christ, you who are seeking to be justified by law; you have fallen from grace. For we through the Spirit, by faith, are waiting for the hope of righteousness. For you were called to freedom, brethren; only do not turn your freedom into an opportunity for the flesh, but through love serve one another. But I say, walk by the Spirit, and you will not carry out the desire of the flesh. Now those who belong to Christ Jesus have crucified the flesh with its passions and desires. If we live by the Spirit, let us also walk by the Spirit. Let us not become boastful, challenging one another, envying one another. If In fact you have successfully crucified the flesh and you have successfully walked in the Spirit without struggle, then surely you should not boast about it, for as soon as you do you will have resurrected of your own will the flesh and all of its passions. 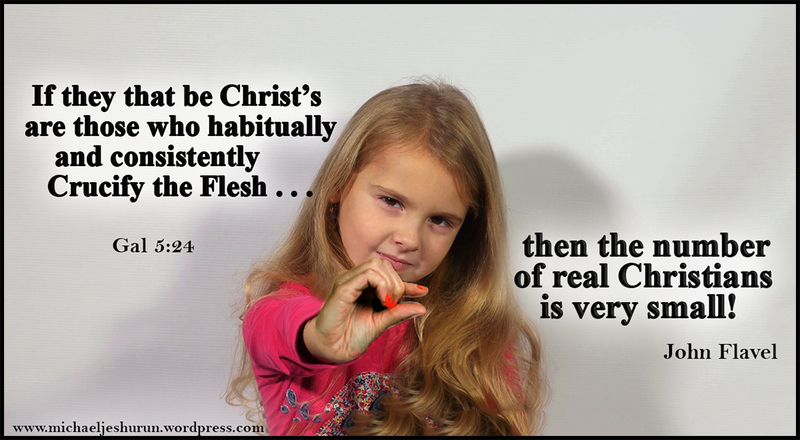 If they that be Christ’s have crucified the flesh, then the number of real Christians is very small. It is true, if all that SEEM TO BE meek, humble, and heavenly, might pass for Christians, the number would be great; but if no more must: be accounted Christians, than those who crucify the flesh, with its affections and lusts, O how small is the number! Previous Previous post: The Gate is Narrow and The Way is Straight That Leads to Eternal life. Jerry, these aren’t Michael Jeshurun’s words but John Flavel’s. A short bio of Flavel brings a lot of insight to this short piece. English nonconformist ministers had a hard row to hoe suffering persecution from a state church. I understand what you are saying. I certainly don’t agree with everything that I post, but what We post is a reflection of what we believe unless we point out our area of disagreement. I certainly understand that unless God had called me I would not be a believer, and I know and believe the Remnant is not a large group, but this post divides believers based upon where one might be in his spiritual walk. Only God can truly make this distinction, because we truly are all sinners. One reason that I dislike a pure Armenian stance is the fact that it tends toward a place of sinless perfection which I see as unattainable at least for me in this lifetime. It was stated concerning Job that he was perfect, yet he stated that the thing I feared has come upon me. Fear is sin, so he was not sinless, but he trusted God even in circumstance that he did not understand. Only Jesus was perfectly able to sacrifice His self so I believe, nice post.